My last week in Israel, I was privileged to take a riding lesson from Uri Peleg, a nationally renowned horseman and promoter of natural horsemanship techniques. It changed my life. I took my first riding lesson when I was about nine. If you are not familiar with English style horsemanship, imagine black velvet helmets, tall black boots, and plenty of snobbery to go around (my apologies to the English, I'm sure their intentions were pure). Unfortunately, I showed up wearing western boots. I should have read the signs. I sincerely appreciate my training in English riding for the attention to detail and meticulous care for equipment and horse, but managing my reins would prove to be a lifelong frustration. Lacking in the area of upper extremities, keeping my reins at the correct length to accurately communicate with my horse was nearly impossible. If it was exhausting for me, I can only imagine the irritation of my ride. But knowing only to work harder to achieve what I wanted in life, I persevered...until I quit several years later, believing I wasn't good enough. So, when friend and fellow riding instructor, Nomi showed me a video of her friend Uri riding and working cattle without any reigns at all, I was mesmerized. The rusty gears started to turn. 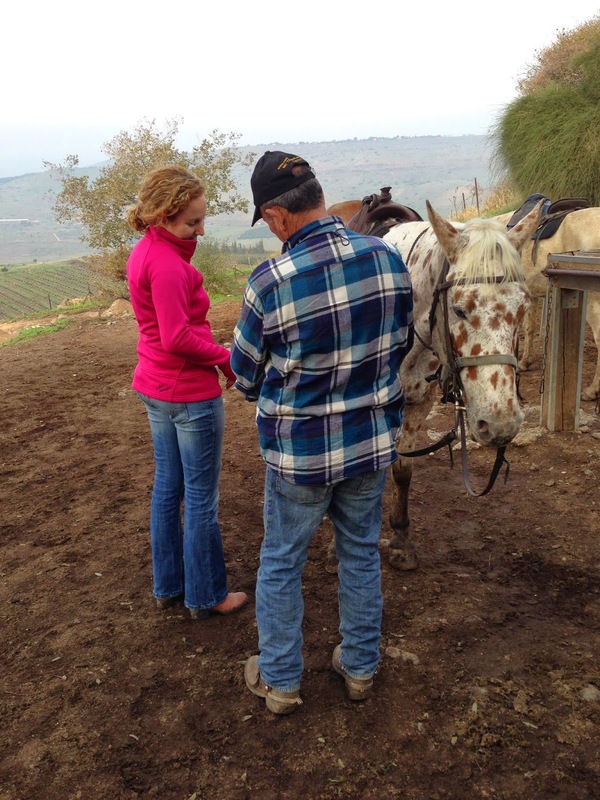 Sitting astride an appaloosa called Winter at Uri's Ramot Ranch, nothing was working. Winter was not responding in the way I wished to anything I'd been taught to do on a horse. It was like finding yourself behind the steering wheel of a car, but having lost everything you knew about driving. Thankfully Uri didn't laugh, but started to teach me a new riding language. This new language uses various gentle but specific leg cues to move forward, back, and turn to the left or the right--reins used as a last resort. It is astonishingly simple, and logical in that you ask the horse to move as guided by your legs and body position. The difficulty was getting off the worn path in my brain of using rein language. I literally had to hold onto the saddle horn to keep my hand from moving. But as I started down the rocky new path of communicating in the natural horse tongue, I felt a slow but steady wave of liberation. Every time Winter responded immediately and exactly as I'd requested, weights of old frustration fell away. We stopped at the top of a green plateau and looked down over the entire Sea of Galilee. If you've ever felt your life changing in the very moment it does, you know the excitement. On the way down, I held my grateful hand up over my head, palm waving. Look, no hands! I smiled to Uri. He smiled back. I should have fisted it in victory.